It will be a divisive issue for the new assembly and already the plan to create a Mourne National Park is splitting political parties, communities, even families. Stretching from Carlingford Lough to Newcastle and Slieve Croob, Northern Ireland's first national park would be a magnet for visitors, creating a tourism boom and up to 2,000 jobs. But local people fear it may be at their expense, pricing young people out of houses, strangling farms and industry, and destroying local communities. It is a glorious spring-like day in the Mournes and high up on the heather-clad slope a shepherd follows a line of sheep down the steep mountain path. Bingian pushes up through a cushion of white cloud to the blue sky above while below the granite walls frame the lush little fields of the coastal plane which stretches down to Kilkeel and the harbour beyond. All looks peaceful but here in paradise people are divided over a plan to establish a Mourne National Park. It is a plan which is dividing communities, political parties and even families. Local people have long accepted they must share Mourne with the hundreds of thousands of visitors who come to enjoy this magnificent landscape but establishing a national park is proving controversial and has left many people worried about the impact on house prices, farms and traditional industries like sand, gravel and granite production. The official consultation period may just have finished but the gap between supporters and critics of the national park seems to be widening. Those supporting the plan point to the potential boost to the local economy. Martin Carey of the Mourne Heritage Trust says that tourism revenue could treble from its current level of around £70m per year. The national park supporters also point to opportunities to brand local produce and claim that the area is likely to benefit from increased investment. 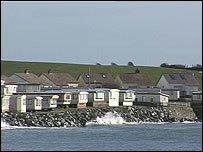 But many Mourne people remain unconvinced and are worried about the impact on their lives. One hundred and fifty thousand visitors arrived here last year and many farmers are worried about the creation of a national park. Farmers like Dessie Sloan have been asking about the legal and insurance implications if more visitors cross their farm land and claim to have had no satisfactory answers from the working party which has been conducting the public consultation. But it is not just landowners who are objecting to the national park plan. The recently established Mourne and Slieve Croob Residents' Action Group says there are real worries about house prices and the danger of younger people being forced to leave the area. Valerie Hanna of the residents' group says the fear is that wealthy retired people will move in and buy up houses, making it impossible for young couples from the area to set up home. Many people are also concerned about stiffer planning restrictions and fear a national park designation would make it even more difficult to start a new business or even extend their home. National Park supporters though paint a very different picture and see a park authority as helping protect a landscape which has suffered its share of 'bungalow blight'. The road from Mourne to Belfast is a well worn path for sand and gravel lorries. Now the sand pits employ about 200 people and owners like Harold McKee are worried that a national park would mean their closure. "In economic terms we would be talking about £10m a year," he said. The quarry and sand pit owners have now set up a mineral processors group to fight the national park plan. The working group which has been conducting the consultation is now sifting through the submissions from supporters and critics. Its report will be forwarded to the environment minister and the new assembly. 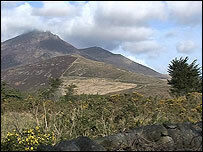 Residents living near the Mourne Mountains are concerned plans for a national park could bring harm to the local area.